This is a great gift for a man/woman that likes to listen to music while in the shower. 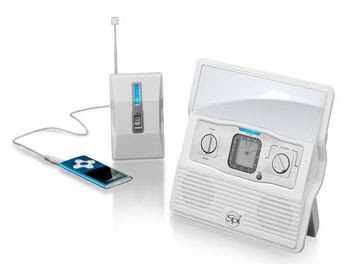 MP3 player, iPod®, or any personal audio device (compatible) this speaker set can be enjoyed from up to 30 feet away using this ingenious transmitter system from Spi®. The two stereo speakers provide high-quality stereo sound and crystal-clear reception. The splash-resistant shower receiver includes FM radio, an LCA clock, and a fog-free mirror that's perfect for shaving in the shower or grooming while you're grooving. Suction cups, built-in vanity stand, and built-in brackets are included for mounting. The device requires 7 AAA batteries, that are not included. Im sure us ladies could find a nice use for this speaker set as well. Give this gift during the upcoming Holiday season! :) Price - $40. Available on Saks.com.